Rumor has it Buenos Aires is an expensive city to visit. With this expectation, Peter and I budgeted $120 for both of us to share each day. We quickly realized we would only need that much money if we wanted to live the high life in Buenos Aires. Don’t get me wrong, we took advantage of the over estimation and ate a few extremely fancy steak dinners, a large bar of Milka chocolate every day, and a couple Argentinean bottles of wine (for me). It felt good to throw the budget-on-a-shoestring aside for a few weeks, but the coolest part was that we could live it up on so little in Argentina. Although $1 U.S. dollar is worth $15.14 in Argentine Pesos, the restaurants continue to raise their prices to get ahead of inflation. I can’t blame them, seeing as how $1 USD was worth only $9.72 Argentine Pesos less than a year ago! As a result, however, the cost to eat out is one of the biggest expenses in Argentina. When we went out to eat for lunch or dinner, Peter and I usually spent $10-15 per meal so lunch typically cost us about $20-30 together after tip. (Tip seems to be 10% everywhere in the world but the U.S.) One thing Peter and I did to both cut down on our spending and feel more “normal” again was buy groceries and make our own breakfast and coffee everyday, as well as making our own dinner every other night. Groceries still seemed expensive, but about half as much as eating out (between $8-20 for a dinner for both of us). 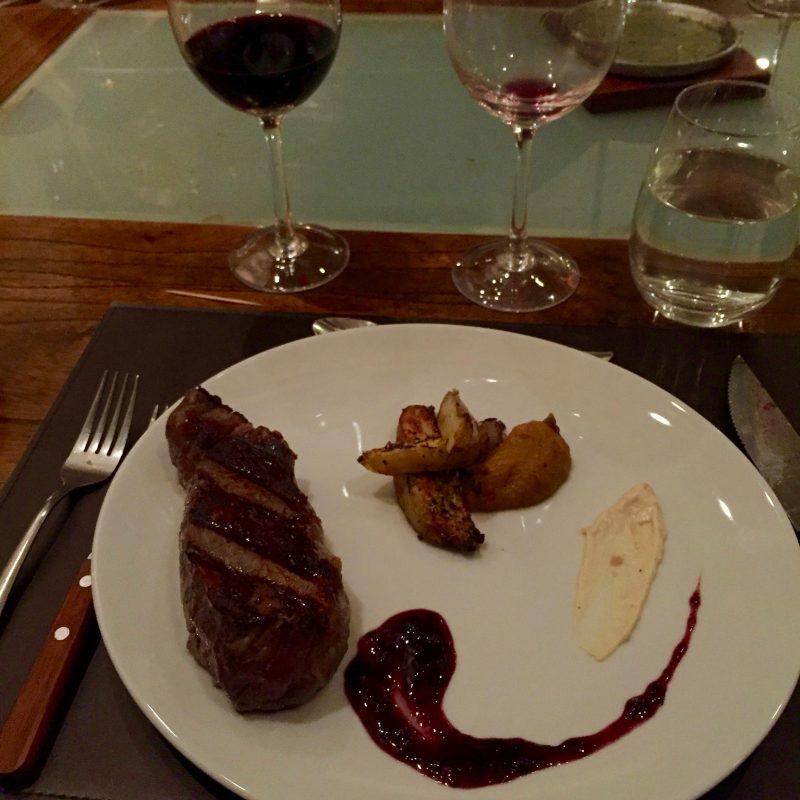 We could have had a significantly cheaper trip if we had stuck solely to cooking our own meals, yet we decided it was important to experience a traditional Asado, or Argentine barbecue, complete with the world famous Argentine steak and wine. This meal was the most expensive meal we’ve ever purchased, but considering it was five courses with a wine pairing for each over the span of three hours, the experience was worth it for us. 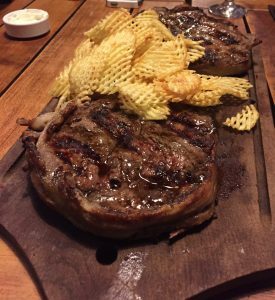 You can find an Asado for much cheaper, but Steaks by Luis is supposed to be one of the best in Buenos Aires. This fancy dinner cost us $75 USD per person (Ouch! I know), but it’s an experience we will never forget. 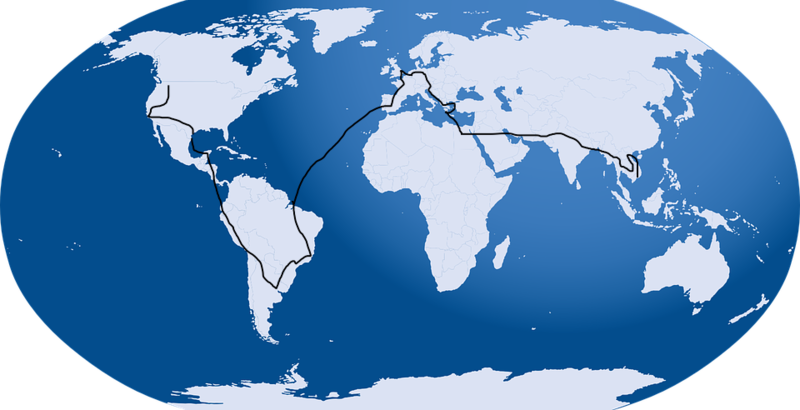 If you can manage to avoid too many decadent steak restaurants, wine, and chocolate bars (because chocolates like Milka and Cadbury are especially expensive in South America), you can easily visit this country on $40-50 per day. 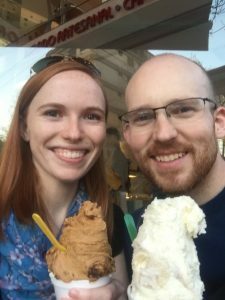 One of the many steak dinners and gelato stops we enjoyed in Buenos Aires. Although eating out may have been expensive, Argentina made up for it with the screaming deals on accommodation. Peter and I were able to find a clean, modern, fully equipped studio in the best part of town for only $40 per night on Airbnb! I still can’t get over it. 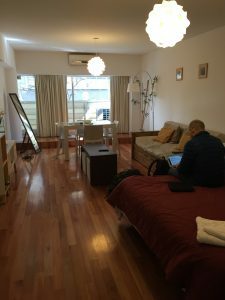 I don’t think we found a rare gem either, since $40-$50 per night seemed to be pretty typical for a place in Buenos Aires. Considering a bed in a hostel is between $10-15 per night here, if you’re a couple, go with Airbnb. It’s only about $10 more and you get the place to yourself. Our amazing Airbnb studio in Palermo through Juan and Gabby. Buenos Aires is a perfect city for people looking to have fun on a low budget. Parks, interesting architecture, statues, and free walking tours litter this city. You can spend hours exploring and not spend a dime. Even taxis aren’t that expensive- typically costing between $4-$8 to get to any popular district in the city. They use meters too, which is nice knowing you’re getting a fair price without having to haggle. Uber exists in Buenos Aires, but it was hard to get one because currently the local government is trying to force them out. Police in Buenos Aires recently arrested and charged a handful of Uber drivers and local Uber managers with crimes. Unless things change or Uber fights back, it may not be an option in the future. Taxis are still plentiful, however. 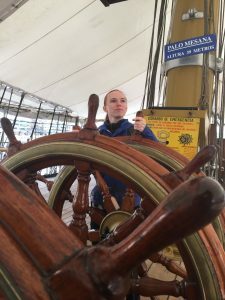 Goofing around on a ship that has been converted into a museum in Puerto Madero. It cost less than $1 USD per person. One thing worth mentioning in a financial post on Argentina is that nearly everything needs to be purchased with cash unless you’re willing to spend up to 10% more for a credit or debit card. Because of this and the rampant inflation in this country, most Argentineans cash their paychecks at the end of each week using the ATMs. As a result, it’s common for many ATMs to be out of cash in the city. Since there are usually only one or two banks on a block, you can spend quite a bit of time running around trying to find cash. Also, the most you can take out at once is $2,000 AP or $130 USD, and they charge you around $6 in ATM fees each time. For this reason, we got a Charles Schwab debit card that refunds all ATM fees before we went. We also tried to pull money out before Friday or after Monday to avoid getting stuck with no cash (which DID happen once, but just for an afternoon). In summary, food is moderately priced, accommodation is surprisingly affordable for a group of two or more, and entertainment can be had for next to nothing. If you’re willing to make your own meals and stick to cheap entertainment, you can easily stay within the budget of $40-$50 per person per day. It may be expensive to get down to Argentina and pricey to fly around such a huge country (which is why we skipped Mendoza and Cordoba), but once you’ve settled in a city, you should have no trouble enjoying the sites without being hard on the pocketbook. What boat is that you’re piloting, and on what body of water? It’s the Presidente Sarmiento, and its docked in the Puerto Modero as a floating museum for its many voyages around the world. I wish I had learned the skills to man a ship though.